This two-in-one edition of two of my older books is being released two months before their prequel, my new hardcover, The Secret Mistress. More Than a Mistress, first published in 2000, is the story of the wild rakehell, Jocelyn Dudley, Duke of Tresham, and Jane Ingleby, in whom he meets his match. Jane interrupts a duel between Tresham and an aggrieved husband, and as a result the duke is severely wounded in the leg. When Jane is late for work at a milliner’s shop and loses her job, she demands that Tresham provide her with a letter explaining that she was late because she stopped to help him. He flatly refuses, but he does offer her a replacement job—as his nurse. He promises to make her sorry she was born before the temporary job comes to an end. No Man’s Mistress, first published in 2001, is the story of Tresham’s brother, Lord Ferdinand Dudley, and Viola Thornhill, with whom he comes into conflict when he wins a country manor in a card game but discovers when he goes to claim it that she is living there and insists the house belongs to her. Neither will back down, and each sets out on a vigorous campaign to drive the other away. But the stakes are high indeed for Viola, and she finally comes to the conclusion that the only way she can keep her home is to wager with Ferdinand that she can seduce him—the loser to quit the house forever. Jocelyn and Ferdinand have a younger sister, who appears a number of times in their books. She is already married to the Earl of Heyward, a man whom they contemptuously dismiss as a dry old stick. However, they do admit that the two seem fond of each other, though that fact makes no sense to them. Heyward is quiet and dull; Angeline is loud and flamboyant and has atrocious taste in clothes, particularly in her garish bonnets. Readers started asking me for Angeline and Heyward’s story, and I started to wonder about it myself! What brought such a mismatched pair together? And is it really a love match? Eventually, then, I had to go back to find the answers and write about them. And I discovered that they did indeed have a story to be told. The Secret Mistress will be published in hardcover at the end of July, 2011. -Elizabeth Cook, Emerson and Cook Book Co.
Mary Balogh has a gift for placing ordinary people in extraordinary circumstances. For many of her characters, life is about survival first, and love becomes the reward for their sacrifices and hardships. This romantic and intensely emotional story will cast its spell on you from the first page. A pair of strong, equally determined protagonists clash exquisitely in this lively, passionate sequel to More than a Mistress. 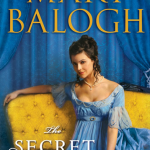 Balogh is a noted writer of historical romances that feature strong, unconventional heroines and often test the limits of the genre. I enjoyed the snap and sizzle in the heated discussions between the hero and heroine, and the realistic challenges they face due to the differences in their social status make for a lively and thrilling tale in which the author skillfully weaves intrigue and romance to keep readers glued to the pages of this memorable story. Mary Balogh has a soaring range of emotion. This story begins as an elegant comedy, with sparkling wit and cheerful flirtation. Then things become serious, then tragic, and then soul-crushingly sad. Ms. Balogh can sweep from high notes to low notes with impossible grace, making the sad and funny blend into pure, aching joy….Mary Balogh turns old into new, sorrow into joy, and popular entertainment into high art. At the most crucial moment in a duel, when the antagonists are about to shoot, a woman screams at them to stop and Jocelyn Dudley, Duke of Tresham, is distracted. His opponent takes advantage of his inattention and shoots him in the leg. The first meeting of Tresham and Jane Ingleby follows immediately after. It had taken iron willpower to remain standing when it felt as if a thousand needles had exploded in his leg. But even though incensed with Lord Oliver for firing his pistol when any true gentleman would have waited for the duel to be reorganized, Jocelyn Dudley, Duke of Tresham, had never had any intention of killing or even wounding him. Only of making him sweat awhile, of giving him time to watch his life flash before his eyes and wonder if this would be the one occasion when the duke, famed as a deadly shot but also known as a man who contemptuously wasted his bullet on the air during duels, would act untrue to form. The needle points had taken over his whole person by the time he had finished and tossed the pistol into the wet grass. He felt like agony personified and remained upright only because he would be damned before giving Oliver the satisfaction of being able to claim that he had been felled. He was also still angry. An understatement. He was in a white-hot fury that might have been directed against Oliver had there not been a more obvious target. He turned his head and looked with narrowed gaze to the spot at the edge of the trees where she had been standing a few moments ago, shrieking like a banshee. A serving girl, running an early-morning errand, no doubt, and forgetting one of the primary rules of service—that one minded one’s own business and left one’s betters to mind theirs. A girl who needed to be taught a lesson she would never forget. She was still there, staring as if transfixed, both hands pressed to her mouth, though she had stopped her caterwauling. It was a pity she was a woman. It would have given him infinite satisfaction to set a horsewhip whistling about her hide before being carted away to have his leg attended to. Deuce take it, but he was engulfed in pain. Only a few moments had passed since he had fired his pistol and tossed it down. Both Brougham and the surgeon were hurrying toward him. The spectators were buzzing with excitement. He heard one voice distinctly. Jocelyn held up his left hand again without looking away from the woman by the trees. With his right hand he beckoned imperiously to her. If she had been wise, she would have turned and run. He was hardly in a position to go chasing after her, and he doubted that anyone else present would be interested in running to earth on his behalf an unappealing, gray-clad slip of a servant girl. She was not wise. She took a few tentative steps toward him and then hurried the rest of the way until she was standing almost toe to toe with him. His eyes narrowed further as he determinedly ignored the pulsing pain in his leg and the near impossibility of standing any longer on it. Her cheeks had been flushed with anger. They paled at this words, and she stared at him wide-eyed, her lips compressed in a hard line. “Tresham—” Sir Conan sounded exasperated. But Jocelyn had already availed himself of her shoulder. He leaned heavily on it, more heavily than he had intended. Moving at last, shifting his weight off his injured leg, he found that the wave of agony made a mockery of the pain hitherto. Lord Oliver was pulling his waistcoat and coat back on while Viscount Russell was packing away his pistol and came striding past Jocelyn to retrieve the other one. Her shoulder did not bow beneath his weight. She was rather tall and slender, but she was no weakling. She was doubtless accustomed to hard manual labor. She was probably equally accustomed to cuffings and beatings for impudence. He had never heard the like from a servant girl. He was well-nigh swooning by the time he reached the blanket the surgeon had spread on the grass beneath an oak tree. He spoke as if he were a barber who had discovered a tuft of hair that did not blend well with the rest of the head. He was a retired army sawbones, supplied by Lord Oliver. Bloodletting and amputation were probably his answer to every physical ailment. “Conan,” Jocelyn said, his teeth clamping tightly in a vain attempt to control the pain, “fetch my horse.” It was tethered not far away. There was a chorus of protests from his friends who had gathered around him. “Fetch my damned horse!” Jocelyn spoke from between his teeth. He had a death grip on the girl’s shoulder. “And serve you right too,” Jocelyn said, throwing her own words back at her, his voice devoid of all sympathy as his friend strode away to bring his horse and the surgeon launched into a protest. But Lord Oliver appeared in front of him before he could turn away. “You would rather be dead, then?” Death was seeming to be a rather desirable state to Jocelyn at that particular moment. He was going to black out if he did not concentrate hard. He strode away without waiting for an answer, while another chorus of “Shame!” came from the gallery, some of whose members were doubtless disappointed that they were not to witness the sawbones plying his trade on the grass of Hyde Park. “My horse, girl.” Jocelyn tightened his hold on her shoulder again and moved the few steps to Cavalier, whose head Conan was holding. Mounting was a daunting task and would have been quite impossible if his pride had not been at stake—and if he had not had the assistance of his silent but disapproving friend. It amazed Jocelyn that one small wound could cause such agony. And there was worse to look forward to. The bullet was lodged in his calf. And despite his words to the surgeon, he was not quite confident that the leg could be saved. He gritted his teeth and took the reins from Conan’s hands. The serving girl stood looking up at Jocelyn. Jocelyn reached for one of the pockets of his coat, only to be reminded that he was still wearing just his shirt and breeches and top boots. But she had turned on her heel and was striding away over the grass, her back bristling with indignation. When Lord Ferdinand Dudley arrives in the village of Trellick to claim the house and estate he has won at a card game, it is May 1 and there are May Day celebrations in progress about the village green. Ferdinand cannot resist joining in the merriment, especially when he spies a particularly pretty young lady with whom to flirt. And for her part, Viola Thornhill, one of the organizers of the celebrations, is intrigued by the handsome stranger who has ridden into the village, and is not averse to a little mild flirtation. Little do the two of them realize that the following day they will be at daggers drawn when they both lay claim to ownership of the same house. The fortune teller was already doing a brisk business. What Viola had also noticed was that the stranger had strolled over to the throwing booth, which had been popular with the young men earlier in the afternoon. He was talking with Jake Tulliver, the blacksmith, when Viola and Mr. Claypole drew near. The stranger turned his head to look at her. He was indeed tall, almost a full head taller than she. His eyes were almost black. They gave his handsome face a somewhat dangerous look. Viola felt her heartbeat quicken. She raised her eyebrows at the boast and looked at the metal candlesticks—the old set from the church vestry—which had been toppling all too readily before the ball the contestants had been hurling at them. Mr. Claypole cleared his throat. “You will permit me to point out that wagers are inappropriate to what is essentially a church fete, sir,” he said. The stranger laughed into Viola’s eyes, almost as if he believed it was she who had spoken. “Let us make sure that the church benefits well from this wager, then,” he said. “Twenty pounds for the church whether I win or lose. The lady’s daisies for me if I win. Move back the targets,” he instructed Jake Tolliver while he set a few banknotes down on the booth counter. She looked about to see that indeed people who had been awaiting their turn outside the fortune-teller’s booth and had overheard the exchange were beginning to gather around. And their interest was attracting more. A number of people were hurrying across the green toward the throwing booth. The gentleman was removing his coat and rolling up his shirtsleeves. Jake was repositioning the candlesticks. She gestured toward them and laughed with the crowd. But the stranger, she saw, did not. He was rolling the ball in his hands, concentrating on it, and squinting ahead to the candlesticks, which now looked an impossible distance away. He could not possibly win. She doubted he could knock over even one. But one toppled over even as she was thinking it and the crowd applauded appreciatively. Jake handed the stranger the ball again, and he concentrated on it as before. A hush fell on the gathered crowd, which had swelled even more in size. A second candlestick teetered, looked is if it were about to right itself, and fell with a clatter. At least, Viola thought, he had not totally humiliated himself. He looked more than handsome in his shirtsleeves. He looked…well, very male. She desperately wanted him to win his bet. But he had set himself a nearly impossible task. There was a collective moan from the crowd. Viola felt absurdly disappointed. “Oh ye of little faith,” he murmured with a wink, and Viola felt a pleased fluttering of awareness low in her abdomen. Then he was concentrating again, and the crowd was being shushed by those who realized that he had not yet admitted defeat, and Viola’s heart was beating right up into her ears. Her eyes widened with incredulity and the crowd erupted into a roar of wild cheering as the ball hit one upright candlestick, glanced sideways off it as it fell, and demolished the fifth with a satisfying crack. The gentleman turned, bowed to his audience, and then grinned at Viola, who was clapping and laughing and realizing that this was by far the most exhilarating moment of the day. She stood still while his fingers detached the small bunch of daisies from her hair. His laughing eyes did not waver from her own—they were very dark brown, she could see now. His skin looked sun-bronzed. His body heat and a musky cologne reached out to envelop her. He carried the daisies to his lips, bowed with careless grace, and pushed the stems into the buttonhole of his shirt.